Time is running away from me! I’m still working on the projects, which was my aim in starting the blog, I just haven’t found the time to write them up. So I’ll try and make an effort now. This one is a skirt pattern I made for work as a teaching resource for a patternmaking & garment construction course we were developing. The cardboard plotter/cutter ran out of ink halfway through the job, so I took the rejects home (perks!). The pattern was a standard size 10, so I didn’t have to adjust it much to fit Frances. Being a teaching resource for beginners, its a pretty simple design. 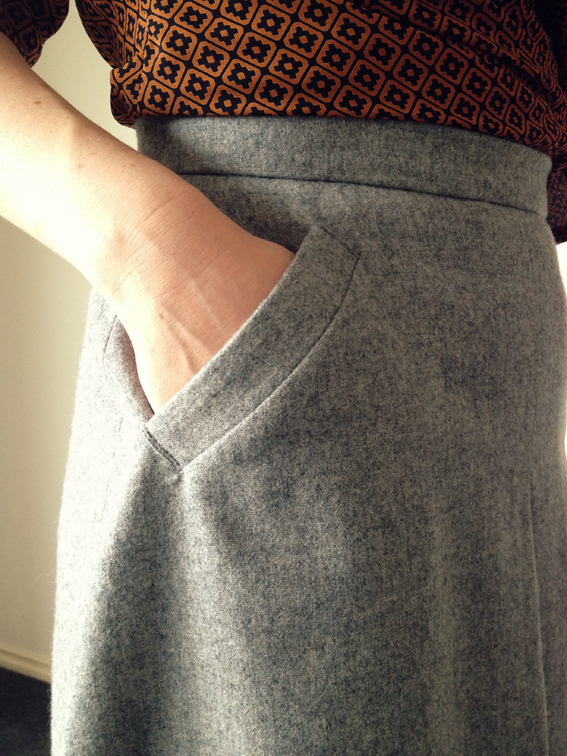 Plain A-line skirt with a straight waistband and centre back zip opening. The only point of interest is an inverted pleat at the centre front, stitched down about 8 cm. I did add the pockets though; a girl needs pockets. The fabric is a grey wool remnant I bought on an impulse about a month ago without much more thought to how I’d use it other than “Winter is coming! I’ll need wool for something, surely…”. I did think though that I’d use it for me, but a pattern ready to go, a rainy cold public holiday and a smiling sister always trumps half formed thoughts of my winter wardrobe. Always. 29 May	This entry was published on May 29, 2012 at 7:53 pm. It’s filed under Projects and tagged A-line, clothing, Fashion, Grey, inverted pleat, Pockets, skirt, style, winter wardrobe, Wool. Bookmark the permalink. Follow any comments here with the RSS feed for this post. Found your amazing A line skirt while surfing the net for A- line skirt that has seams that go in a V shape from the waist down, Both front and back. Does that make any sense to You? You seem to be a knoledgable person in these matters. Can You please help me find a pattern that fits my discription. And I also wonder if the V shape makes the skirt fit better or else whats the purpose with it? I’m so glad you liked my post! I had a look at your blog post and I think what you’re looking for is an A-line skirt with a V shaped yoke. You’re right, the yoke does help shape the skirt. A properly fitted skirt would originally have darts in the front and back to give it shape. In this case the designer has incorporated the dart shaping into the yoke seam. I did a quick search through some commercial pattern sites and found this. Apart from the pleats, it seems to be what you’re after. If you want a better fit than commercial patterns you have to start drafting them from scratch, which is a whole other rabbit hole to go down!